Total area seeded to lentils decreased 24.8% from last year's record high, to 4.4 million acres in 2017. This decline was mainly attributable to Saskatchewan's lentil area (which accounts for close to 90% of the total acreage in Canada), which fell 25.8% from 2016 to 3.9 million acres. 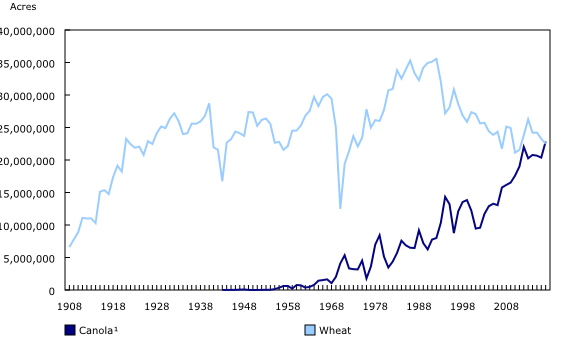 Over the past century, wheat has always been the major player in field crops grown in Canada. However, recent decades have witnessed canola (known as rapeseed in early years and one of Canada's greatest crop innovations) gaining popularity to the extent that it has replaced wheat as the largest field crop in terms of area in 2017. Beginning with 3,200 acres in 1943, total area planted to canola has climbed to 22.8 million acres in 2017, almost half a million acres more than the area dedicated to all varieties of wheat (spring, durum and winter wheat). This is the first time that canola acreage has surpassed that of wheat. The June Farm Survey, which collects information on field crop seeded areas in Canada, was conducted between May 26 and June 12, 2017, with approximately 24,500 farms. They were asked to report their seeded areas of grain, oilseeds and special crops. June seeded acres are subject to updates from subsequent surveys during the current crop year. Data on final acreages for 2017 will be released on December 6, 2017, and may be subject to revision for two years. Farm surveys collect data from Quebec, Ontario, Manitoba, Saskatchewan and Alberta for every cycle of the crop survey program. However, data are collected only twice a year (in the current June Farm survey on seeded areas and in the November Farm survey on final crop production) for Newfoundland and Labrador, Prince Edward Island, Nova Scotia, New Brunswick and British Columbia, which represent between 2% and 4% of national totals. Release calendar: The dates for upcoming releases of stocks, areas and productions of principal field crops are available online. Data for June 2017 are compared with final 2016 data.